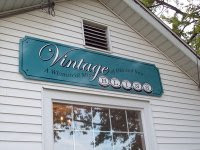 Back in September, I told you Vintage Bliss, a boutique owned by the lovely Sheryn Kelderhouse. If you're local to Rochester, Vintage Bliss is right in the Village of Webster at 30 North Avenue (Route 250). Vintage pieces and all sorts of handmade finds are available at Vintage Bliss. Beginning later next week, you will soon be able to buy my jewelry from my Loubird Handmade™ line right at Vintage Bliss! I am so excited about this because it is such a fabulous shop and many of you are on the east side, so you can stop right in to have a look. I am bringing several items next Wednesday, so they should be available for sale not long after. While I was there today, I couldn't resist a couple great items. This spring I am redoing our 3 season breezeway into a jewelry studio with loads of natural light. I want to sit out by the windows with the birds chirping, lots of sunlight, and a larger studio space. I wish I could use that area year 'round! When I redo it, it'll reflect my line and feature vintage elements and some bird accesssories. I found a great little plaque/hanger today that I intend to put out there. I also am trying a fabulous new lip balm by m Luxe. It is almond and tastes fabulous--I think I might grab a pomegranate flavored one next week. If you haven't gone to Vintage Bliss, you're missing out. You can find skin care recommended by Oprah and InStyle called FarmHouse Fresh, as well as greeting cards, handbags, candles, and so much more. I'm so excited to have my items in this great little shop!